The start of a New Year is traditionally a time when we resolve to make changes. Change is particularly imperative in US mathematics education, which is built on a (Nineteenth Century) pedagogic model that long since passed its expiry date. In a nutshell, the school system we all grew up with was essentially developed in Nineteenth Century Britain to provided a global infrastructure to run the British Empire. In modern terms, the British Imperialists created an “Internet” and an “Internet of Things” using the best computational and manufacturing resources available at the time: people. 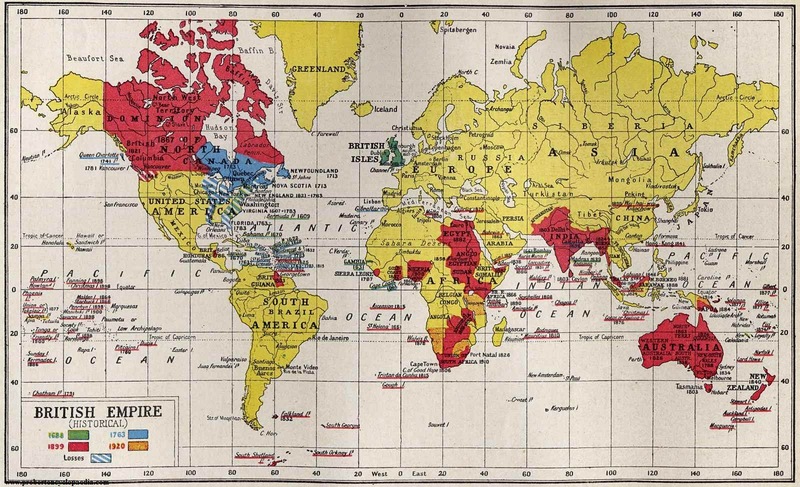 Controlled by an “Internet of human computers”: The British Empire in 1922. While few of us in K-16 education today see it as merely a process to prepare young people for work, we inherited a system built to do just that. Now we have an electronic, digital Internet, does it make sense to continue to use the old system? What do Twenty-First Century citizens need from their education? While not the only thing—not even close—equipping young people for work is still an important educational goal, both for the individual and for society as a whole. Accordingly, it makes sense for those of us in systemic education to be constantly aware of the skills that are actually required in the workplace. If those skills change, so should the education we provide. A good place to start is by asking the leaders of the leading companies what they look for when hiring new employees. 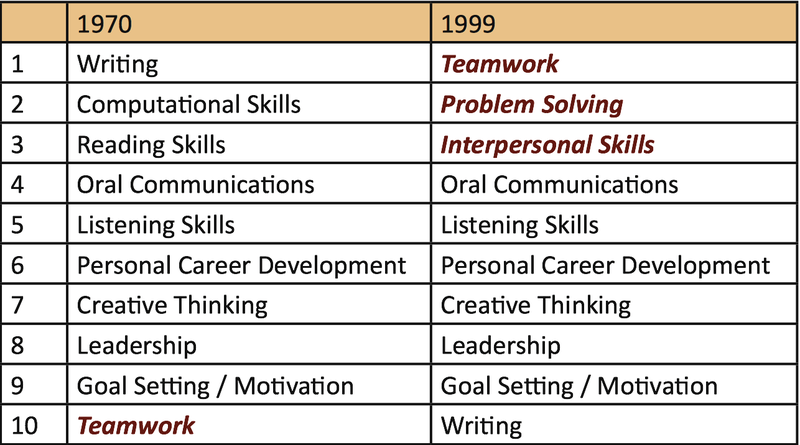 The table below shows us what skills the Fortune 500 companies were asking for in 1970, then again thirty years later in 1999. It makes for dramatic reading. While the required skills ranked from 4 through 9 remained unaltered, the top three changed completely. The most important skill in 1970, writing, dropped to number 10, while skills two and three, computation and reading, respectively, dropped off the top ten list entirely. The most important skill in the workplace at the start of the Twenty-First Century, according to those leading companies, is teamwork, which in a single generation had leapt up from number 10. The other two skills at the top, Problem Solving and Interpersonal Skills, were not even listed back in 1970. Clearly, the world (of work) has changed, at least for those of us living in advanced societies. Unfortunately, for those of us in the United States, and many other parts of the world, our education system has failed to keep up. In large part, this is because of the hard-to-avoid inertia that so often comes with national (or statewide) education systems. By and large, many politicians and bureaucrats are far less aware of rapidly changing workforce requirements than those in business, and politicians frequently pander to the often woefully uninformed beliefs of voters, who tend to resist change–especially change that will affect their children. The fact is, any parent who opposes adoption of the CCSS is, in effect, saying, “I do not want my child prepared for life in the Twenty-First Century.” They really are. Not out of lack of concern for their children, to be sure. Quite the contrary. Rather, what leads them astray is that they are not truly aware of how the huge shifts that have taken place in society over the last thirty years have impacted educational needs. But the situation is very different for their children. They are being thrust straight into that new world. To prepare them for that, you need a very different kind of education: one based on understanding rather then procedural mastery, and on exploration rather than instruction. One of the best summaries of this societal change, and the resulting need for educational shift, that I know is the 22 minutes TED Talk Build a School in the Cloud, given by the educational researcher Sugata Mitra, winner of the 2013 TED Prize. In his talk, not only does Mitra explain why we need to make radical changes to education, he provides examples, backed by solid evidence, of how a “Fortune 500 oriented,” team-based, exploratory approach works. In the late 1990s and throughout the 2000s, Mitra conducted experiments in which he gave children in India access to computers. Without any instruction, they were able to teach themselves a variety of things, from English to DNA replication. Another good account of this need for educational change is provided by Sir Ken Robinson, also in a TED Talk (11 minutes). These ideas are not new. Indeed, they are mainstream in educational research circles. They just have not permeated society at large. For instance, Harvard physicist Eric Mazur has been teaching by Inquiry-Based Learning (IBL), to use one of several names for this general approach, for over twenty-five years, since he first noticed that instructional lectures simply do not work. He describes his approach, and the reasons for adopting it, in his 2009 talk Confessions of a Converted Lecturer (18 minutes, abridged version). In mathematics, the IBL approach goes way back to the 1920s. I wrote about the best known proponent in two Devlin’s Angle posts back in 1999: May, June. Moore’s ideas have been adapted and used successfully in present-day mathematics classrooms, as shown in the promotional video Creativity in Mathematics: Inquiry-Based Learning and the Moore Method (20 minutes). Lest my account of R L Moore and that last video portrayal leaves you with the impression that IBL math is for bright college students, see also this WIRED magazine account of the success Mexican teacher Sergio Juárez Correa had when he took a Mitra inspired approach into a poor school in Matamoros, a city of half-a-million known more for its drug trade than for being at the forefront of Twenty-First Century mathematics education. AS OF TODAY, THAT’S OVER FIFTY YEARS AGO! It’s long past time for the education system to catch up with the world outside the classroom. That should be our resolution for 2015. Is the aim of primary school education to teach children the skills needed for the workplace? Should we educate 8 year olds by asking the leaders of Fortune 500 companies what they are looking for in potential employees? The Common Core math content is good but rather too prescriptive, the practice standards are excellent, but the assessment methods and content from PARCC etcetera completely fail to meet the aspirations for assessment described in the Linda Darling et al paper. This cannot be done by computer presented and graded assessment. It isn't going to work. Some serious attempts to address this issue are needed, now, or the whole lot will come crashing down, giving a field day to the "I told you so" brigade. ...BTW, word "one" was left out of sentence beginning "For instance, Harvard physicist Eric Mazur..."
The goals for children expressed in Common Core are great. Will they work? Can we rewrite the textbooks, retrain the teachers, change student expectations, and create meaningful new nation-wide tests in a time-span of five years (with nothing being tried in real schools for most of that time)? Should we find out before converting forty-five states to CCSS? Have we? Answer key: dunno. yes. no. One cannot defend an horrific implementation with a defense of the goals. Employees who can't read, write or "compute", i.e. know arithmetic, geometry and algebra, aren't going to be able to solve problems, contribute as members of teams in collaborative settings nor communicate effectively. That chart needs to be updated with a 3rd column, as it is 16 years out of date. Sumitra is an impresario and a highly controversial figure. I read the Wired article you referenced. It had significant shortcomings. Thank you for the videos! I enjoyed them a lot! Could you elaborate on the close alignment you see between teamwork and interpersonal skills and the Standards for Mathematical Practice (listed above as CC Mathematical Principles)? I'm not sure I see those connections, although I do think the mathematical practices are extremely well oriented toward problem solving, and that many other efforts to reform math education are oriented around teamwork. @Steven Carr: Well, that’s your question, not mine. I started out by stating that employment was not the main goal if education, and indeed I was not very flattering in my portrayal of the era when it was. But as I went on to say, it makes sense for those of us in education to be aware of current workplace needs. Our job is to help young people prepare for the life they will lead, and a significant part of that will be spent in work. We owe them an adequate preparation for both life and work. Indeed, that’s what we get paid to do. @Paul Martin: I assume they start from a position that anyone who applies for a job has basic writing skills, but they recognize that it is not necessary for everyone to be a good writer. Putting a premium on teamwork gives a lot of latitude on individual skillsets. I know a fairly large number of bosses, by the way, and none of them would suggest eliminating literacy education. Indeed, they are all highly literate and cultured. True, they are all Silicon Valley bosses, but since we are talking about Fortune 500 companies I assume the ones I know are fairly representative. I suspect you were intending not to be taken literally. @Howard Phillips: I agree totally. Thanks for writing. @Shecky: Agreed! And I've fixed the typo, thanks. @Kenny Tilton: Three points. 1. In many US school systems the Common Core does not represent that much of a change from what went before. 2. Nothing in the CC has not been tried elsewhere in the world. 3. I am certainly not defending any particular implementation, some of which are indeed horrific. (New York comes to mind.) My focus was on the Common Core as a set of standards—which is of course exactly what it is. Implementing it is Step 2. I would say, having gotten Step 1 right (well, as good as can be expected to start with), the focus should be on getting Step2 acceptably right. @Ellie K: I don’t disagree with anything in your first sentence except the inclusion of geometry. I don’t see knowledge of geometry is critical to being a good problem solver, though it may occasionally play a role. (That is not to say learning geometry has no value, of course.) I like your elaboration of “compute” in terms of knowing. One of the main thrust of the changes the CC seeks to bring is the need today of knowing arithmetic and algebra, as opposed to the old “learn to follow the rules without understanding” approach that so many of us had to live through. That was doing without knowing. Glad you enjoyed the videos. Thanks for writing. @Julie Wright: If I were asked to sit down and generate a list of individual mathematical practices to constitute educational standards for individual student achievement that would produce people who were well equipped to have a good choice of rewarding careers (in addition to being prepared for 21st Century life in general), I would and up with something like those eight. An I suspect the same would be true for anyone in education (It is, of course, what the people who wrote the CCSS did!) That’s what I meant by aligned. Sure, the eight CC principles don’t map to the Fortune 500 list in a tight one-to-one fashion. But that is to be expected. One focuses on employment skills, the other on education. Clearly there are many levels of literacy (and of course numeracy). It has taken me a long while to hone my writing skills from formulaic PhD thesis which got me a job in Silicon Valley to more balanced R&D proposal writing following my recent departure from the FE sector (and b4 that HE) in Aberdeen, Scotland. Let me say I am in favour of some core tested skills for students. I was astonished by how many of our young have been able to bluff their way thru the edu system without acquiring basic literacy skills, and I am not emphasising such as spelling and indeed I appreciate that some are not wired for such. 1. Be prepared for life in the 21st century. If I oppose the CCSS for consisting of that goal, am I, in effect, saying, “I do not want my child prepared for life in the Twenty-First Century.”? This conclusion excludes other reasons for opposing the CCSS—for example, that the CCSS are much too vague to be useful to those in actual classrooms. Or that, because of this vagueness, the CCSS are easily misinterpreted, allowing the Powers that Be in education to claim that the CCSS support their particular (and often problematic) agendas. "What do Twenty-First Century citizens need from their education? " Otherwise they might be subject to the mischaracterizations and poor assumptions given in this post. I got to calculus in high school with no help from my parents. That is virtually impossible to do these days. People still complain about "traditional" teaching even though our schools have been using Everyday Math for over ten years, and before that it was MathLand. "The table below shows us what skills the Fortune 500 companies were asking for in 1970, then again thirty years later in 1999." The table is what they say, but not what actually happens. Businesses want people with specific skills, especially in the STEM world. Personnel might ask for fuzzy skills because that makes their role seem much more important. However, the people in the departments want those with specific content skills. Woe to those in STEM who don't keep up with technology. It doesn't matter how much teamwork or problem solving skills you have if you don't keep up with new technology. In fact, many older people only put on so much experience on their resume because that would make them seem old. My wife was told by a Fortune 500 company she worked for that people over 40 don't work as hard. "The fact is, any parent who opposes adoption of the CCSS is, in effect, saying, “I do not want my child prepared for life in the Twenty-First Century.” "
No, they are saying no to low expectations. CCSS does not do STEM. Neither did NCLB. That's why many of us parents had to teach that material at home and to ensure mastery of basic skills. Schools don't do that. The highest level in PARCC ("distinguished") only means that one is likely to pass a course in college algebra. For many parents, CCSS is meaningless and too low of a standard for their kids. The main problem is that some schools now limit the number of kids who can get into algebra in eighth grade. Schools are using CCSS as justification for this change. I could come up with an engaging Harkness Table approach to education, but it would require a whole lot of extra individual work outside of class. Unfortunately, too many modern educational pedagogues use "21st Century" platitudes to hide low expectations and make full inclusion sound magically better than anything they can label "traditional". Traditional has been gone from our schools for decades, so why keep repeating that old nugget? What 21st Century citizens need is not an 19th century monopoly. They need choice. They can choose IBL ... or not. Thanks for the additional comments. We received a fair number of comments (as was to be expected with this topic). This is not an open forum so we don’t publish all comments, rather we make editorial decisions to provide a reasonably broad coverage of opinions on the topic. The goal of the column is to inform–and to stimulate reflection and discussion among–people interested in mathematics and mathematics education (primarily, but not exclusively, collegiate level). @Katherine Beals: I don’t disagree. I wrote “is, in effect, saying, X” not that X *was* their motivation. I share the misgivings and dismay many have with the way CCSS have so far been implemented in many states. But the rational response to that is to fix the implementation, not throw away the standards. @SteveH: I don’t agree that CCSS sets too low a standard. But that is not to say that individual teachers or school of districts might not interpret them with a low bar, a real and present danger if student performance on tests is used as a primary means of evaluating teacher performance. While there are certainly important lessons to learn from and with IBL-style educational approaches, we'll never master them by this sort of uncritical cheerleading for corporate-style buzzspeak and anecdata. Regurgitated factoids about changes in the way that certain corporations choose to rank various vaguely defined "skills" in sloppily designed surveys of desired employee characteristics should not be presented as important insights into the role of modern pedagogy. For instance, why should we assume that Fortune 500 companies in the modern globalized workforce have the same importance in the future career prospects of the average US student as they did back in 1970? What percentage of the US workforce is employed by them? (Spoiler: A shrinking 10% or so, down from about 20% around the time of the 1970 survey.) Why should we care what they want in their employees more than we care what, say, government agencies or small businesses want? Similarly, Mitra's anecdote about letting a self-selected group of children play with a fascinating toy and, not surprisingly, learning a lot of information in the process doesn't really shed new light on the societal challenges of providing universal primary and secondary education. Many modern educators are chasing the ill-defined buzzwords of "innovation", "creativity", and "communication" as eagerly and credulously as their counterparts a hundred years ago chased the buzzwords of "discipline", "knowledge", and "advancement". You can't achieve either set of qualities with inspirational fables and sermonizing. IBL approaches are definitely worth investigating and pursuing, but not with this sort of credulous motivational-speaker-level gush. IBL seems like a great idea, and its proponents are very eloquent. But there's a significant body of research cautioning us that we need to take this with a grain (or more) of salt before joining the parade. Having read this, I don't do a "full IBL" classroom, in my calculus class, though there are certainly some substantial project-based elements. Those have proved, in my experience, to be very rewarding, but very challenging for the students. To the extent that I've measured the reasons, they seem to align with the reasons you might expect after reading the review article above-- there's a lot of information running around, most of which is irrelevant at any given stage and a major skill is picking out relevant detail from the forest of facts. It's valuable and rewarding to do this a few times a semester, after quite a bit of direct instruction from an expert, a number of worked examples, and a gradual transition from more standard to more difficult problem types. But reading your article, it's easy to walk away with the sense that you're advocating that we should do this all the time, for every topic, in every class! 1) What's your response to the IBL skeptics in the education research community, such as the authors of the study above? 2) What do think is the right balance of IBL and direct instruction? Or should we not do direct instruction at all anymore? Best wishes, and thanks for a thought-provoking article. --Jason. @ Kim Plofker You seem to have come to this site expecting an academic article. It’s not, Devlin's Angle is a quick-read, monthly column designed to put ideas out to stimulate reflection and discussion among the mathematical community and any mathematical bystanders that happen to chance by. The MAA publishes a number of journals that will likely provide the more substantial artices you are looking for. On the other hand, you did take the time to write a response, so maybe it did achieve it’s aim. :) Thanks for writing. NOTE: We received a number of comments that raised points that deserved to be aired, but it is column policy not to publish comments that do not identify the writer. @Kieth Devlin: As a geometry guy, I don't know if it is critical to becoming a creative and intuitive thinker and problem solver. But for me it did. Not the geometry they taught in highschool or college, though. One day, I came across a copy of Euclid's Elements and instantly fell in love. School had ruined maths for me although I did like maths as a child. Euclidean Geometry broke me out from that. I have a notebook full of notes, but I'm still working on this project, but it's exhilarating. It sparked me out of stagnation. There are certainly other things that can promote individual growth in the areas previously described... such as hacking, which has a central focus of problem solving. But, I think that Geometry is very effective path. It's just unfortunate that it gets slaughtered in the classrooms. "Many innovative approaches to education such as problem-based learning (PBL) and inquiry learning (IL) situate learning in problem-solving or investigations of complex phenomena. Kirschner, Sweller, and Clark (2006) grouped these approaches together with unguided discovery learning. However, the problem with their line of argument is that IL and PBL approaches are highly scaffolded. In this article, we first demonstrate that Kirschner et al. have mistakenly conflated PBL and IL with discovery learning. We then present evidence demonstrating that PBL and IL are powerful and effective models of learning. Far from being contrary to many of the principles of guided learning that Kirschner et al. discussed, both PBL and IL employ scaffolding extensively thereby reducing the cognitive load and allowing students to learn in complex domains. Moreover, these approaches to learning address important goals of education that include content knowledge, epistemic practices, and soft skills such as collaboration and self-directed learning." An article by Daniel Chazan and Deborah Ball, titled, Beyond Being Told Not To Tell discusses the roles of direct instruction and of inquiry/discussion in the classroom.